Just because the February labor report could be a blip doesn’t mean we shouldn’t review it. To be fair, the January labor report was also a blip since it’s highly unlikely job creation averages above 250,000 in 2019 let alone the 311,000 jobs created in January. The February report doesn’t signal a recession is coming soon if you look at the 1-year change in private payrolls. Year over year growth fell from 2.2% to 1.9%. Growth fell to 1.6% in September 2017 when there was a blip lower in job creation. Yearly growth for the cycle peaked at 2.56% in February 2015. That yearly growth peak wasn’t a signal economic growth was about to accelerate. There was a slowdown from late 2015 to early 2016. 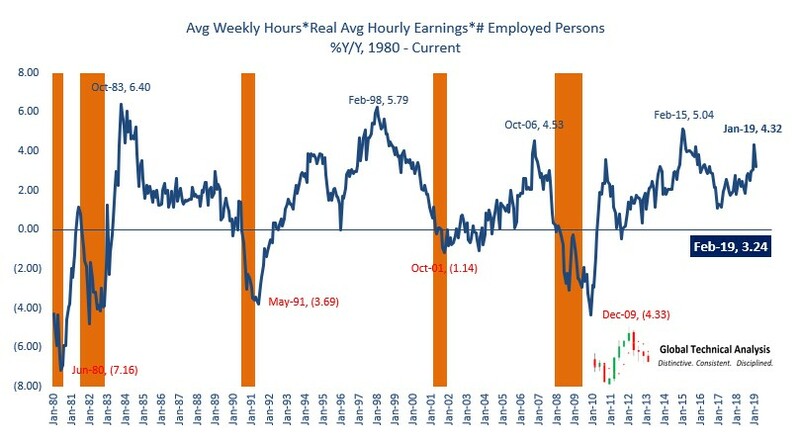 If you multiply average weekly hours worked by real average hourly earnings which is multiplied by the number of employed people, you get a proxy for aggregate income. Effectively, that’s weekly wages multiplied by the number of employed people. Since weekly wage growth fell from 3.4% to 3.1% and payroll growth fell from 2.2% to 1.9%, it’s no surprise the aggregate income proxy’s yearly growth rate fell from 4.32% to 3.24%. The cycle peak was 5.04% in February 2015. Currently, it’s still towards the high end of this cycle’s range as you can see from the chart below. One indicator which has shown some efficacy is service job creation minus manufacturing job creation. This difference correlates with the cycle because the service sector creates most of the jobs. As you can see, this difference fell last year partially because manufacturing was strong. It’s now set to increase because manufacturing has been weakening. The difference between the service and manufacturing ISM PMIs was relatively high. You need to realize the catalyst for the weakness before drawing conclusions.